Being that sensitive skin’s girl I am and being my skin always so problematic, wherever I go I always feel the need to carry some skincare friends with me in my handbag – I also reserved a little plastic clear bag to store some of them and try to stay organized. They only take a little tiny room in my bag, but can really be lifesavers if you suffer of sensitive skin, eczema or dryness and need some skincare help on the go as well. A recent addition to my skincare stash is the La Roche-Posay Cicaplast Baume B5 (£13.50) which I picked up when I finished up my old eczema treatment. I’m only trying it for a few weeks, but I really like the texture and the slight fragrance. Thought for body and face, this really helps in hydrating your chapped and dry skin while also repairing and soothing it. I have this bad, itchy, nasty eczema around my lips and this comes super handy when my skin starts hurting and I need something powerful to fight that feeling. Another essential of mine is the Botanics Organic Hydrating Eye Cream (£6.99) which is a life savior for my under eyes area where my skin get pretty dry and sensitive – a small amount of this really makes the difference, but while other eye creams can be a bit too aggressive for my under eye skin, this is so gentle, natural and hydrating that I couldn’t live without it now. 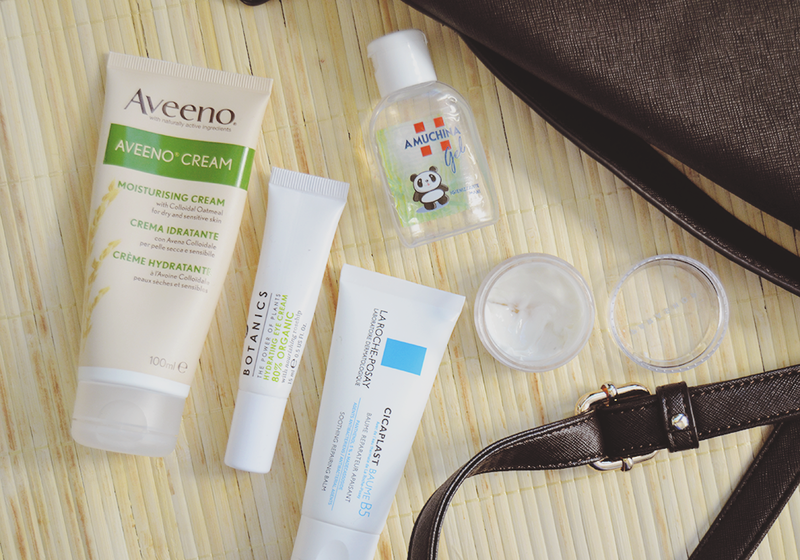 I also bring always with me my loyal Aveeno Cream (£8.93): aiming to be a good eczema treatment for any skin type and above all for sensitive skins, this never disappoint me when it comes to deeply hydrate the skin without feeling too heavy. It also sinks in super quickly and easly so it’s perfect for on the go and quick applications. A must-have in my handbag is a little hand sanitizer which comes pretty handy when I need to apply one of my on-the-go skincare essential – you never want your hands to be dirty when you touch your sensitive skin! Also I love carrying around mini pots like this one where I place a few pumps of my favorite face moisturizers to have them always with me if I’m spending my night out somewhere that is not my own place, or if I feel I need some skincare gems in my long days far from home. They avoid you to bring a full size product with you, are so handy and not bulky at all and need only a tiny little room in your bag. I’m such a fan! 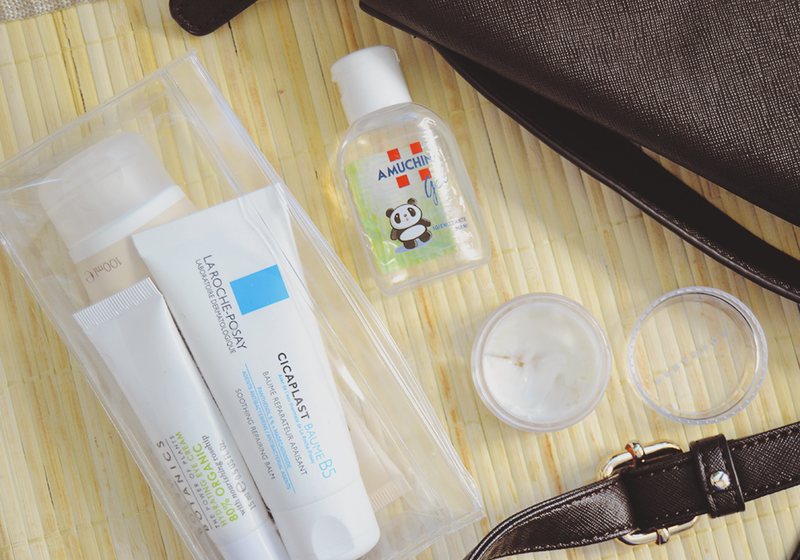 What about your on-the-go skincare essentials?